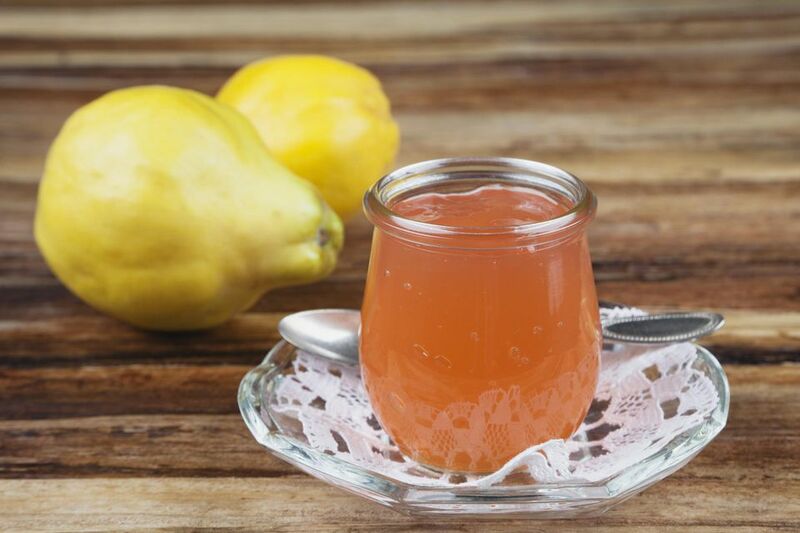 Mediterranean countries have been growing and using quince for more than 4,000 years, including in traditional jam recipes known as Marmalatha Kythoni. It looks and tastes a little like a lumpy pear, but it's not necessarily a fruit you want to eat raw. The flesh of the quince is dry, hard and has a very tart flavor, so it's best when it's been cooked. The fruit has a high pectin content, though, which makes it ideal for cooking down into a jam or jelly. In Greece, lamb and pork also use with quince, so the taste of this jam goes well as a condiment with roasts of either. This jam is all-natural — meaning no additives or preservatives, just simply quinces, sugar, and a little lemon juice. It's a light jam, and perfect for toast, as a filling for croissants and as a condiment. Clean the quince the way you would prepare an apple for a pie, peeling and removing the seeds. Cut the quince into small chunks or grate it and put into a bowl of water as you are cleaning and cutting the remaining fruit. Quince will turn dark if not covered with water. Drain and transfer the quince to a pot with water. Cover and bring to a boil over high heat. Boil for 30 minutes, turn off the heat and leave the pot on the stove for 30 minutes. Transfer to a large saucepan, add sugar and 1 cup of water, and bring to a boil over medium heat, stirring continuously with a wooden spoon to prevent sticking and browning. Reduce heat and simmer for 30 to 40 minutes, stirring frequently, until the jam melds, the excess liquid cooks off, and the jam drops from a spoon in chunks. Add lemon juice, stir for 5 minutes, and remove from heat. Allow to cool for 30 minutes, then transfer to jars with airtight lids, but do not seal until the jam has cooled completely. Feel free to play around with extra flavors in the jam, adding a little bit of vanilla extract, nutmeg, or cardamom. To change quantities, use this ratio: 2 parts peeled and seeded quince to 1 part sugar, by weight. Quince jam can be stored for up to a year and the color of the jam will darken over time to varying shades of red.